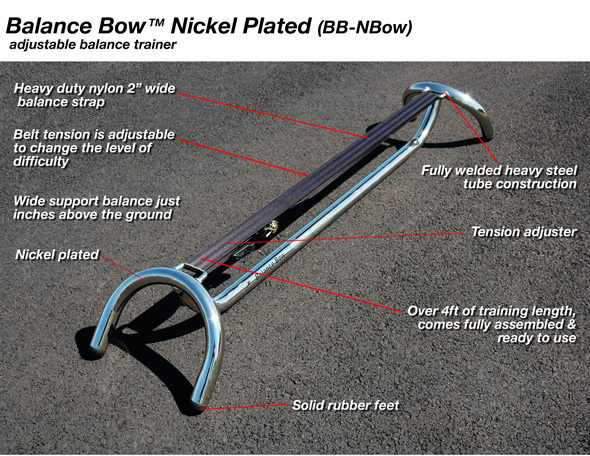 Club Balance Bow™ Pro System contains everything you need for all levels of balance training. The System contains the Club Balance Bow™, the Bow Poles™, and the Bow Beam™. Club Balance Bow™ Pro System provides the widest range of balance training options from very simple and supported exercises, to the most rigorous and challenging ones. Basic balance skills can be tested and developed on the Bow Beam™, an attachable balance beam. The Bow Beam™ although only inches off the ground provides all the same difficulties as a standard balance beam, but without the same risks. The Bow Poles™ make training safer and more fun. The Bow Poles™ are a must for all levels of training because they allow the user to regain their balance quickly. The Bow Poles™ help to make safer and easier to work on all levels of balance exercises from simple to the most advanced. The Club Balance Bow™ with the Bow Beam™ removed provides intermediate to advance balance challenges and skill development. The Club Balance Bow™ provides the challenge of a tightrope or slack line, all within inches from the ground. The Club Balance Bow™ System is unmatched in the field of balance testing and development. 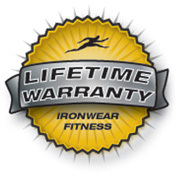 Club Balance Bow™ is the leading edge tool for balance training and the most challenging. It is fun, addictive, and extremely affective. It is a must for training any athlete and requires a level of concentration and muscle control beyond all other equipment. From rehabilitation to elite athlete training nothing is better for balance, core awareness, core strength, and building quick reflexes. Club Balance Bow™ patented system combines the challenges of a Tightrope, Highwire and Slackline with the spring response of a Trampoline to form a low impact dynamic training and exercise system. The risk of falling is greatly reduced because even the most advanced moves are done only inches from the ground. This makes it possible for the athlete to be safely challenged, learn more rapidly and attempt new things. Club Balance Bow™ is constructed of heavy gauge steel and is nickel-plated for extra durability. Club Balance Bow™ is a serious piece of professional training equipment and many of the exercises should only be done with appropriate supervision. Balance Bow Training™ is done by positioning all or part of the body on the Balance Bow™ , then synchronizing the mind and body to maintain balance while exercising, while manipulating objects, or while doing both on the Balance Bow™. Balance Bow Focus Training™ is the ultimate Zen mastering tool, can help the trainee to clear their mind and focus on the position and control of all aspects of the body. Balance Bow Training requires complete posture awareness with calm, yet lightning quick muscle response to correct the position of one’s core to maintain balance (equilibrium). It provides a whole new level of self-awareness. Tai Chi movements, Kata patterns and Yoga positions all become all become more challenging and focused on the Balance Bow™. Balance Bow Biomechanics™, balancing on the Balance Strap™ involves the biomechanics of balancing on a line. This unstable equilibrium, requires you to constantly work to maintain your center of gravity over the line. Once your center of gravity is slightly out of alignment your center of gravity falls to one side. Regaining equilibrium requires that you do one or more of the following: move your center of gravity back over the balance point, or move the balance point back under you, or you can cause a force to counteract the angular momentum, for example by the quick movement or extension of an arm or leg. Club Balance Bow™ has a Bow Strap™ which is stretched across the Bow ™ like a string on an archery bow. The Tensioner™ which adjusts the flexibility of the Bow Strap™ to increase or decrease the level of difficulty. The Bow Legs ™ and adjustable rubber Bow Feet™ of the Club Balance Bow™ conform to the floor to help to prevent movement when a load is applied to the Bow Strap™. Club Balance Bow™ is simple to understand but nearly impossible to master.